Whether you ignore or deny it, whether you hide or renounce it, the truth will go on its way, propelled by the beatings of a heart whose innocence was stolen, but which clings to life, obstinately. Robert Goolrick tells us about his story, his loves, his friends, and his trouble. Red. In Hebrew, it becomes adom, a synonym for Adam, adamus, made of red earth. In Latin, red, or ruber, is related to the Italian river, the Rubicon, and therefore to the phrase : « cross the Rubicon », which means reaching, and sometimes stepping across, the point of no return. That point, the author came very close to it, as many times as the scars on his arms can testify. He dances with life, spares death a few steps, and finally comes back to us through this heartrending testimony. If Robert Goolrick wasn’t a writer, he would be a painter. 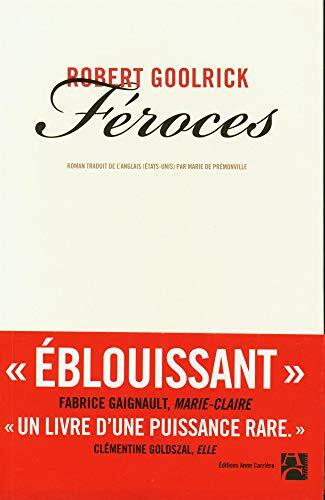 His novel, Féroces, would be a triptych ; each painting would stand for a part of the novel. In the first painting, he would describe a bourgeois setting. He would highlight the bright colours of the ladies’s dresses and jewelry. He would play with his brushes to bring to life the plumes of smoke rising from the gentlemen’s cigars. In the second painting, he would slip a few precursory signs of the coming tragedy, by playing on the flames of a fire burning in the hearth, or the amber colour of the drinks. He would scatter a few touches of red, here and there, in fruit or drapes. Then, gradually, we spectators would start noticing that the sky was not as blue as before, that there weren’t as many smiles on the faces, and that threatening shadows were creeping. That would lead us to the final paiting of the triptych, filled with solitude, terror and blood. Then a semblance of light would return in the artist’s signature, bringing his work to an end. A signature as an echo. And when you fully realize the extent of moral cruelty towards a defenceless child, the sadistic remarks he had to endure, then it’s time for the truth to be revealed in its true colours. The thread of the story merges with the edge of the bloody blade. The shedding of blood stands for the tears that were never shed, to set free an overflowing soul. Robert Goolrick has a gift for making a trivial word deep. Through repetitions, he underlines the desperate dimension of this haunted tale. The impression won’t leave the reader until he turns the final page, and even after. You walk along with the author through a story getting darker and darker, sprinkled with strokes of red. See the tomato and its tender flesh, which cuts as easily as the skin of the wrist. And the painter still dabs a few touches of life in a tale grazed by the ghost of death. As days unravel in a more and more oppressive atmosphere, we become all the more sensitive to the way the author uses his palette, be it to make us laugh, to comfort us, to make us cry or to leave us frozen with terror. Off all the repetitions he uses, the red tomatoes are the most frequent. Having had the opportunity to read part of the book in English, I took great pleasure in discovering Marie de Premonville’s precision work on this translation. I mentioned the thread of the tale, and the razor blade, and another thread might be considered, that on which the translator makes progress, through Robert Goolrick’s pages, to find the right balance and the right echoes to the original words. The author makes the most of trivial routines, and gives them a particular dimension and strength within the narrative. Here the adapter’s talent does justice to the elegance of the text without lowering or weakening it. Ouahou, really impressed by this chronicle in english !!!! Not my translation ! But it give me the fantastic opportunity to be read by Robert Goolrick.